The Finnish pedagogy and didactics have a long history. The tradition in universities and in schools consists of valuable theoretical and practical concepts. These concepts are often carrying meanings and background beliefs that are important to understand. 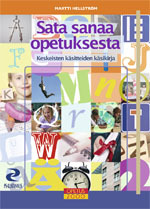 In this book (Sata sanaa opetuksesta, PS-kustannus 2008) there are 100 most interesting concepts in an alphabetical form. The book helps teachers, headmasters, parents, politicians and members of administration to find a mutual language, which is important while developing teaching and school practices. The presentation of each concept includes questions for teachers and parents. The writer Martti Hellström is a Finnish elementary school headmaster, PhD (education) and the editor in chief of the professional magazine for Finnish classteachers. The book was written under the guidance of Pertti Kansanen, who is one of the internationally best known Finnish professors of education.